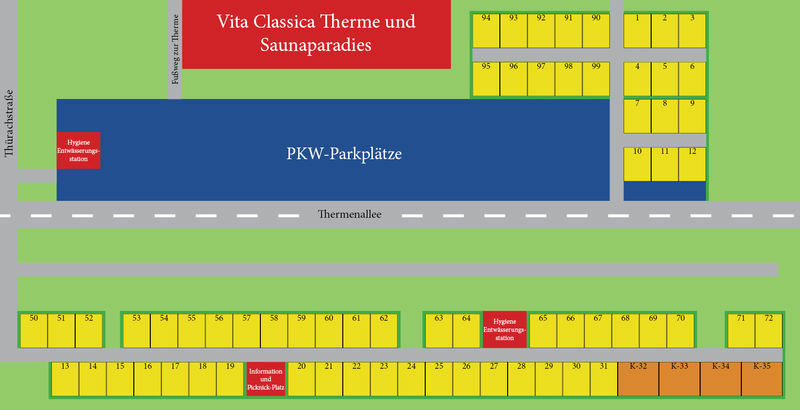 The motorhome campsite in Bad Krozingen is located next to the Vita Classica thermal baths and close to the spacious spa garden. The motorhome campsite with75 pitches is located right next to the Vita Classica thermal baths and close to the spacious spa garden. Our60 square meter pitches are flat created with a small lawn.Exclusive comfort and more space you will find on our four pitches with approximately100 square meters and also included a small lawn. All necessary supply- and leisure facilities are within a few minutes. The motorhome campsite hastwo dump stations with sanitation and fresh water connection and is equipped with electricity and garbage disposal. The motorhome campsite isopen all year-round, barrier-free and arrivals are possible all time. Several times a day the campsite gets controlled. New incoming vehicles can pay the parking fee during the opening times (see below) directly at the reception on the campsite or at the tourist information. If new guests found without payment document, they get noted and receive a payment document visible. We ask that you pay immediately and automatically at the reception. For arrivals after 6 pm there is also the reception of the Vita Classica thermal baths available. The campsite is only for motorhomes not for caravans! Those prices are only valid in relation with an overnight stay on the motorhome campsite.